Unless you’ve been living under a rock the past week (or are currently in warmer parts of the globe – lucky you! ), you’ll be well aware of the ‘Beast from the East’ now hitting certain parts of the UK this week and some towns already bearing the brunt of what has been dubbed ‘snowmaggedon’. We felt now would be a good opportunity to round up our favourite snowy experiential campaigns past and present. There’s snow way you’ll want to miss these….!! At the end of January an interactive SWISS billboard was erected at Kings Cross Station to promote the Swiss airline. Commuters were encouraged to tweet #SnowNow to achieve instant snow on demand and create a snowy backdrop photo opportunity. The campaign targeted the UK market who tend to book last minute getaways at this time of year. Ironically the message of the campaign highlighted that ‘Snow is only a click away’… the reality was it was only a matter of weeks away! 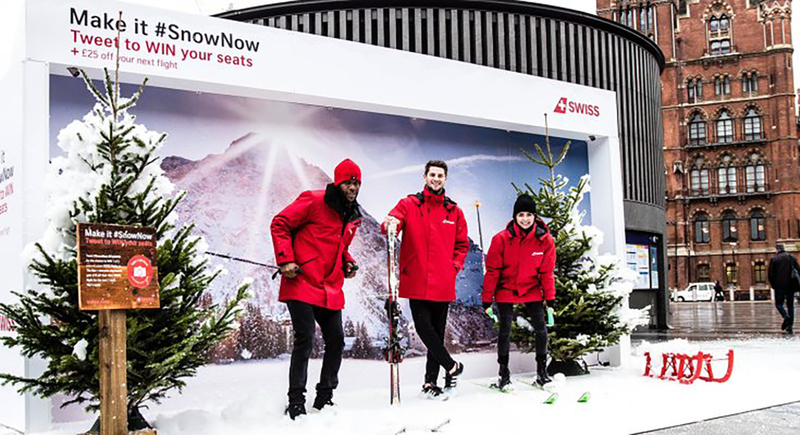 To encourage participation consumers who took part were given £25 off their next SWISS flights and the exclusive opportunity to win one of five return flights to the Alps. Samsung offered unique virtual reality experiences powered by the Galaxy Note8 and Gear VR at the Pyeonchang Winter Olympics allowing fans to snowboard, ski and skeleton down a mountain, compete with other fans, as well as escape to space in “Mission to Space VR: A Moon for All Mankind”. Samsung has a long running partnership with the Olympics and delivered over 4,000 devices to all Olympians as well as the PyeongChang 2018 Olympic family allowing them to use Samsung mobile technology to enhance their experiences at the Games and connect more conveniently. The brand must be doing something right. An article in the Drum this week revealed that Samsung has recorded the most Olympics related digital content engagement, http://bit.ly/2CNRWtw. 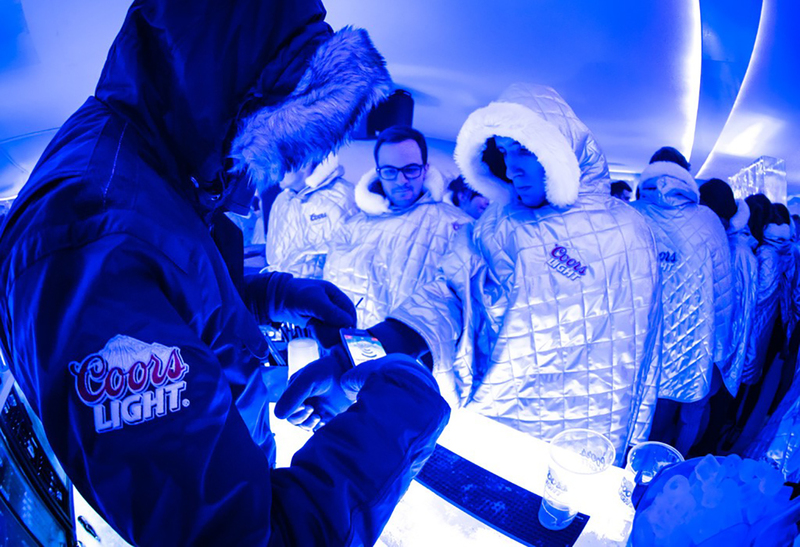 Coors Light has been touring various cities offering the opportunity for ‘intrepid adventurers’ to experience their ice bar, fully kitted out with DJ turntables consumers were served ice cold Coors Light cocktails whilst listening to up and coming DJs. We’re sorry to bring up the ‘C’ word as March approaches, but it’s a good one! A snowy highlight of ours was the Samsung Studios project in the Alps which we helped to deliver with Cheil Worldwide and Ignition Havas Sports. 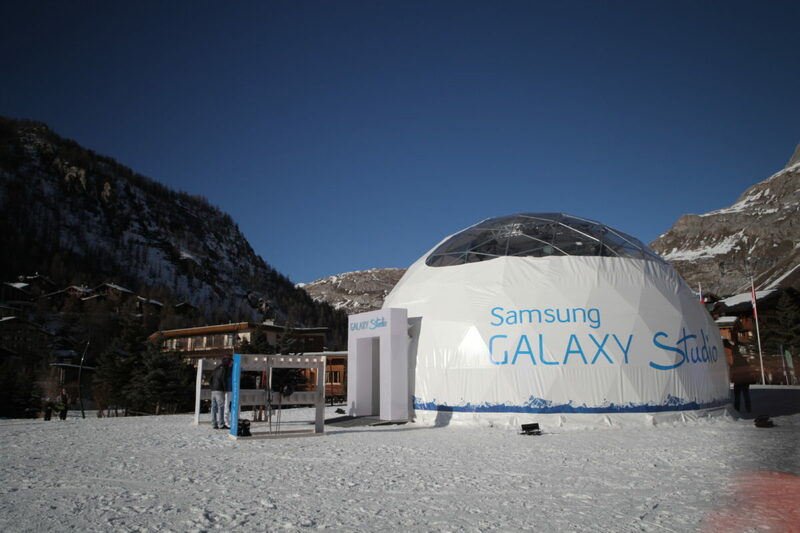 We bought the Samsung technology to Cortina, Val D’Isere and St Moritz along with our fantastic, and warmly wrapped up, Samsung trained staff who carried out over 17,000 product demonstrations…. that was a bit of all white! !